Guys...this is the kind of flexibility you are going to have on this trip. 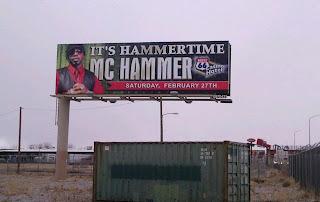 Just stay...Hammertime in New Mexico! I can't imagine a more bizarre experience. @Taben - We know... We know... We are going to be much more flexible in the future now that we are sans trailer and dog and horrible driving conditions. hey, very neat blog! I sell tickets for this venue... HA!